It’s all about China today, as stronger than expected manufacturing data and hopes for trade talk progress combined to give global markets a lift. Weak retail sales are a possible negative, however. (Monday Market Open) Friday’s enthusiasm looks like it might spill over into the new week as the focus remains squarely on China. A surprisingly healthy reading from China’s manufacturing sector early Monday was the first positive data out of that country in a while. While this could be a sign that Beijing’s efforts to stimulate the economy might be working, it’s also important for investors to consider taking a breath. This is a good number, but we need to see more evidence that things are doing well. One data point isn’t a trend, and bonds don’t really appear to be moving much on the news. That said, the better Chinese data could conceivably provide market support today for some U.S. sectors with more exposure to China, like Info Tech, Materials, and Industrials. Hopes for progress when trade talks resume later this week also could be helpful, but again, a lot depends on how things go. Back on the home front, retail sales for February disappointed with a 0.2% drop. Analysts had expected a 0.3% rise, so this might raise concerns about the consumer. Retail sales have now come in flat or lower in three of the last four months. However, Treasury and stock prices didn’t appear to have much initial reaction to the news in trading before the opening bell. In corporate news early Monday, airline stocks were mostly higher in pre-market trading despite a technology outage that appeared to ground some flights before a fix was announced. Delays are still possible, media reports said. Anyone flying somewhere today might want to keep an eye on the situation. When you think back to 1998, what comes to mind (assuming you’re old enough to remember)? Maybe it’s the Clinton administration, or Michael Jordan’s last championship run. Whatever 1998 might remind you of, the Q1 we just had was the best for U.S. stocks since then, and that appears to have the market in much stronger shape than where it started the year just 12 weeks ago. While the S&P 500 Index (SPX) remains about 3% below its all-time high close from last fall, it’s up more than 13% between the end of December and the end of March, led by so-called “cyclical” sectors like Information Technology, Industrials, Consumer Discretionary, and Communication Services. When you consider some reasons for the big Q1 comeback after the Q4 collapse, it could partly reflect continued consumer health, signs of progress in talks with China, and the Fed going dovish after raising rates four times last year. Some of the stocks that often lead momentum, like the FAANGs and chipmakers, regained some traction in Q1, and that might have helped the overall market. U.S. data during the quarter was mixed to good, but there’s been some slowing in both the U.S. and world economies that might bear watching. Analysts are looking for weak U.S. Q1 growth both in earnings and in overall gross domestic product (GDP). Last week’s yield curve inversion led to talk among some analysts about whether that might be one signal of a possible recession. So even though stocks are acting healthier, we’re not necessarily out of the woods yet as Q2 begins. That said, one could argue that despite the rally in Q1, stock values haven’t really gotten out of hand. Forward price-to-earnings (P/E) on the SPX finished Q1 at 16.3, below the five-year average of 16.4, according to FactSet. It’s well above the 10-year average forward P/E, but that’s arguably less relevant because it still includes 2009 when stocks reached historically low P/E levels. A lot of last week’s optimism appeared to center around renewed hopes for a trade resolution with China, and some of the stocks with exposure to China’s market did pretty well on Friday, including Boeing (BA) and Caterpillar (CAT). The question is whether the negotiations in China last week made any true progress, as they already are taking longer than the administration had said back in November when the deadline was set at March 1. Trade talks continue in Washington this week. The latest vote of confidence in stocks might be the suddenly energetic initial public offering (IPO) market, which got another “Lyft” (pardon the pun) from the IPO of ride-hailing company Lyft (LYFT). Shares rose nearly 9% on their first trading day Friday. An active IPO market often can symbolize investor and business confidence in the market, because few companies want to go public if investors don’t seem confident. LYFT’s strong first day could end up being seen as good news for Uber, a competitor that’s also planning an IPO. That said, it’s important for investors not to get too caught up in IPO enthusiasm. It’s important to avoid confusing a product with a stock. Just because you enjoy using a product doesn’t necessarily mean a stock is a good buy, and this applies to IPOs in general, not to any specific one. The financials of a company ultimately are what really matter most. Another reason investors might want to take the IPO optimism in stride is some of the geopolitical concerns that still outweigh many other aspects of the financial world right now. Until there’s a trade deal between the U.S. and China, it potentially could be hard for the broader stock market to break out of its recent trading range. The SPX has been in a relatively narrow range between just under 2800 and 2850 over the last week or two. It might need a new positive catalyst to move higher. Earnings season starts in less than two weeks, but forecasts are for weaker results than a year ago, so it’s uncertain if corporate results can provide the jolt they have in recent quarters. Another possible piece of market-moving news in the near future is the March payrolls report, due this coming Friday before the open. Recall that the February report was a big disappointment with job growth of just 20,000. The March report might show whether that was a weather- and shutdown-related fluke or maybe something more serious. 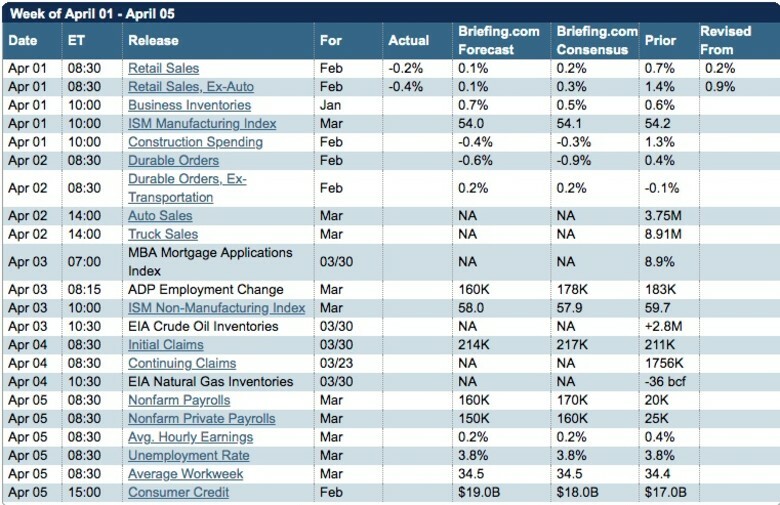 We’ll discuss analyst estimates for March job and payroll growth later this week. Retail sales and construction spending for February are both due this week, along with March auto sales data. Interest rates also might get their share of coverage in coming days, as they have for a while now in the absence of much geopolitical or earnings news. The 10-year U.S. Treasury yield ticked up just slightly on Friday to finish above 2.4%. That’s lower than where it started the quarter at around 2.68%, but it was enough to move the yield just ahead of the three-month yield, ending the inversion at least for one day. There’s no guarantee, however, that rates won’t invert again in the future if investors remain worried about slowing U.S. and global economies. The yield inversion—the first since 2007—was probably one reason the market got beaten down a week ago before clawing back by Friday. QUARTERLY TALE: Could this year-to-date chart tell the story of Q1 in one glimpse? Arguably, it might. 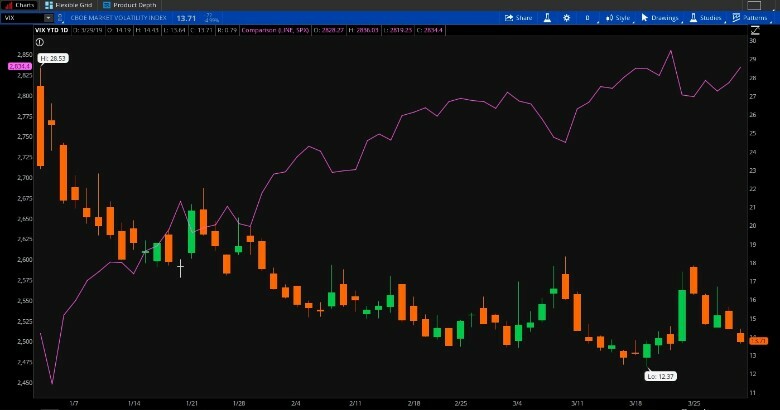 The candlestick tracks the performance of the VIX, the market’s so-called “fear index.” It’s settled down measurably since the start of the year. Meanwhile, the S&P 500 Index (purple line) had its best Q1 since 1998. Data Source: S&P Dow Jones Indices, Cboe. Chart source: The thinkorswim® platform from TD Ameritrade. For illustrative purposes only. Past performance does not guarantee future results. Brexit Countdown Begins Again: It’s never easy to directly chalk up a move in the stock market to a specific event, but it might not be just a coincidence that stocks pulled back from early gains Friday just about the same time as news hit about the U.K. Parliament rejecting Prime Minister Theresa May’s Brexit agreement for the third time. The S&P 500 Index (SPX), which had been up about 0.5%, suddenly lost most of those gains, though it did bounce back pretty quickly. As April begins, there’s less than a two-week countdown for the U.K. ahead of an April 12 deadline. Either the European Union accepts another delay in Brexit at that point, or the U.K. could face a potentially messy “no-deal” Brexit. So far this year, it’s hard to argue that Brexit worries have had a big impact on European stocks, which rose about 12% in the Q1. Nor has it seemed to be a major factor for the U.S. market. Still, the SPX’s sudden but short-lived downturn following Friday’s news might represent a preview of possible shakiness if things don’t get resolved by that April 12 deadline. The European Commission said Friday it expects a no-deal Brexit. Stay tuned. Sector by Sector with Brexit: Which sectors might be helped or hurt by a no-deal Brexit? It’s hard to think of any that would be helped too much, except possibly for banks. Some U.S. banks might benefit if they draw business away from U.K. banks facing economic uncertainty. That might be possible, but some analysts say uncertainty in European financial markets could also hurt U.S. banks. Many U.S. multinationals with exposure to the European economy could face possible issues if Brexit turns into a mess later this month. Some of the biggest U.S. exports to Europe include products like agricultural commodities, chemicals, aircraft, and pharmaceuticals. That means companies in Materials, Health Care, and Industrials all could see an impact. There’s also a big services trade, with intellectual property one of the key U.S. exports across the Atlantic. This could be an issue for companies in Info Tech like Apple (AAPL), Microsoft (MSFT) or some of the chip makers. Q1 Index Watch: While the SPX rolled out to big Q1 gains (the best quarter for the index since 2009), other indices performed even better. The Nasdaq Composite (COMP) ran up gains of better than 16% in Q1, and the Russell 2000 Index (RUT) of small caps climbed 14%. The Dow Jones Industrial Average ($DJI), burdened in part by weakness in Boeing (BA), had just 11% gains in the quarter. Info Tech, which got taken out to the woodshed in Q4, led all S&P 500 sectors in Q1 with better than 18% gains, while Financials, Materials, and Utilities all ended up near the bottom of the sector board for the quarter.